For past several months, Baba Birjinder Singh Bedi, supported by his aunt Mata Parshotam Kaur Bedi, has been rendering Sewa for the above project at Dera Baba Nanak. 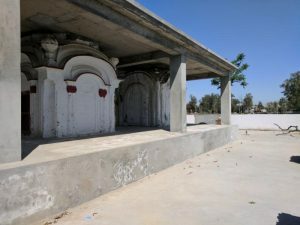 The Devi Mata Mandir, a revered place of the Bedis, was in a dilapidated condition and Baba Birjinder Singh Bedi took upon himself the task of repairs and improvement of the Mandir complex. In this project, Bedi Foundation is not involved financially but is rendering project support services. The financial support is being rendered by Baba Birjinder Singh Bedi and Mata Parshotam Kaur Bedi. 1. Cemented flooring in the pilgrim shelter. 2. Electrical wiring in the shelter area. 3. Electrical wiring, cemented flooring and painting in the Caretaker room, adjoining the pilgrims’ shelter. 4. Levelling and cemented flooring in the front and rear courtyards of the Mandir complex. 5. The main gate of the Mandir complex has been improved upon. The columns’ height has been increased and a horizontal beam placed on top. 6. Roof supported by six columns has been casted on the two Mandirs; domes of the mandir are above the roof. 7. Electrical wiring within the mandir complex. 1. Marble fixing on the Mandir platform and on the stairs leading there to. 2. Designing and improving the entrance doors of the two mandirs. 3. Painting of the complex with appropriate paint material. 4. Building of a small toilet. Donations for this project can be sent to Bedi Foundation and they shall be routed to the project fund. This report is as of 10th April, 2017.